Introducing a new way to WordPress — it’s called Gutenberg Editor, hello to all WordPress bloggers. WordPress is the ultimate king of blogging. It is the best and most popular platform for bloggers to present their ideas on. 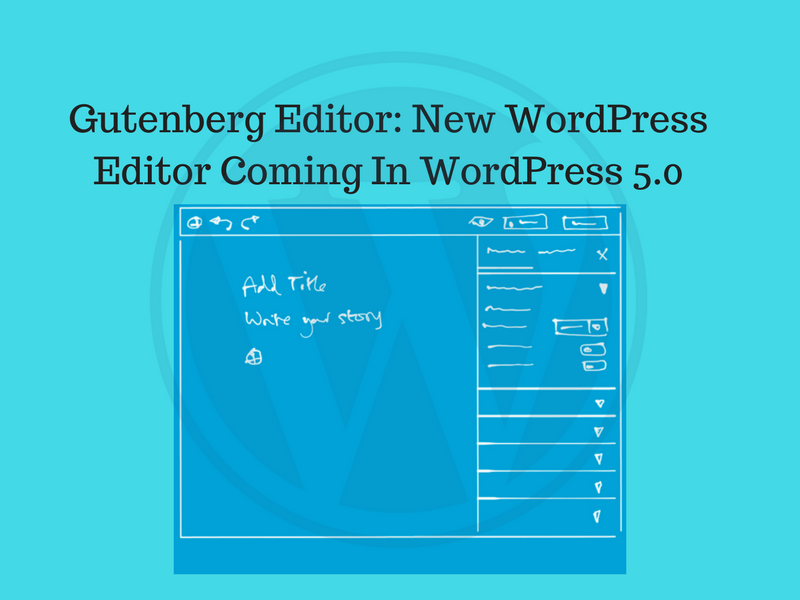 An effective blogging platform “WordPress” soon introduce Gutenberg Editor in WordPress 5.0. Every year, WordPress developers decide on a number of ‘focuses’ for upcoming development, get ready to make your words, pictures, and layouts look as good on screen as they do in your imagination, without any code. Great News that switch on your creative think tanks and start blogging. Let’s get a completely redesigned editing experience. Gutenberg is a new editor for WordPress. The goal is to bring more of the modern word processing functionality and ease-of-use to the online experience of WordPress, lot of us utilize shortcodes and HTML to make things work. Gutenberg makes it easier, especially for those who don’t have much knowledge of WordPress. The new official editor to create posts, pages, and other content types. Provides Multiple ‘blocks’ that can be rearranged and customizable to build your content. Enables high-level formatting and design options, without asking about coding. Note*Gutenberg is named after Johannes Gutenberg, who invented a printing press with movable type more than 500 years ago. WordPress will modernize, streamline, and simplify the content creation experience with Gutenberg editor. it is a completely redesigned editor aimed at replacing the current TinyMCE editor that WordPress has used. The Gutenberg editor uses blocks( multiple “blocks”) to create all types of content in contrast with the current editor works in a single box where you write your text, add your images, insert videos, etc. The excellent part about blocks: It eliminates things like shortcodes and embed codes. Suppose you are looking for inserting a Gallery in your post, You need to insert a shortcode to add a gallery to your post, Now you have a smooth path with Gutenberg to use a “gallery block” to insert your gallery. WordPress is currently on WordPress 4.9.X, it is expected that Gutenberg editor will release as part of WordPress 5.0, which is the next WordPress release.